Schedule and descriptions subject to change without notice. Join the ABC Children’s Group and the American Booksellers for Free Expression (ABFE) in supporting and protecting the free speech rights of young readers. More than 100 pieces of art from well-known children’s illustrators, including special pieces created in recognition of Judy Blume, this year’s honoree, will be auctioned. Proceeds from the auction support ABFE, the Kids’ Right to Read Project, and Banned Books Week. Tickets are free for bookseller members of the ABC Group at ABA; $10 for other ABA-member booksellers; $25 for students over 21 with valid ID; and $105 for all others. To join the ABC Group at ABA, email Matthew Zoni. For questions about ABFE membership, email abfe@bookweb.org. At publisher offices around NYC. Pre-registration required. Meet the Editor gives booksellers the opportunity to experience the book editing process through in-person visits with New York book editors at their offices. Booksellers will go directly to their assigned publishing house at 9:30 am, where will meet with editors for approximately 90 minutes. The structure of the editor meetings will vary by publisher and are meant to give a behind-the-scenes look at the philosophy and process of book editing. Booksellers will be on their own to return to Javits following the publisher visits. Pre-registration has been extended to May 15. 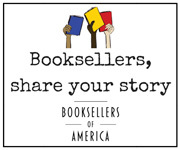 Booksellers will be randomly assigned and will receive their publisher information by email prior to BEA. The Celebration features the presentation of the 2015 Indies Choice Book Awards and the E.B. White Read-Aloud Awards, as well as the introduction of Indie Next List authors and award nominees. Reservations are now closed; however, booksellers can add their names to a waitlist. There is a max of three (3) booksellers per store location. Seat assignments will be emailed prior to BEA. Questions regarding the luncheon should be addressed to Mark Nichols at mark@bookweb.org. NEW TIME–- Doors open at 11:45 am and program begins promptly at noon. ABC Group Members and Friends of CBC are invited to enjoy a lively lunch with more than a dozen children’s book authors as they pitch their new projects. “Learning the list” has never been this much fun! Pre-registration and pre-payment ($25) is required. Space is limited, and registration is first-come, first-served. Registration closes on May 15. Booksellers will receive their author assignments via email in May. ABC Group Members and Friends of CBC are invited to sit down and share an intimate and relaxing teatime with a beloved author or illustrator. This event is a perennial BEA favorite. Booksellers will choose four preferred authors and illustrators attending the event, and will meet with three. Pre-registration and pre-payment ($20) is required. Space is limited, and registration is first-come, first-served. Booksellers will receive their author assignments via email in May. Note: We may not be able to accommodate author and illustrator selections for registrations after May 15.